Rapaport went even further, posting an expletive-ridden video addressed to the students on Jan. 19, which he hasn’t taken down as of Jan. 28. The New York Daily News found itself in Barnes’s crosshairs for a story that accused several Covington students of wearing “blackface”—coloring their faces black to mock black people. The accusation traces back to a photograph from a basketball game that likely occurred between 2011-2013, when the Covington fans engaged in a “blackout”—a common occurrence in college sports where a team’s supporters coordinate to don all-black clothing and sometimes even paint their bodies and faces black, just as is visible in the photo, which was posted in 2015 to an online discussion forum. This usually only occurs when the team has black in its colors. There are, for instance, “whiteout” and “blueout” events for other colored teams. 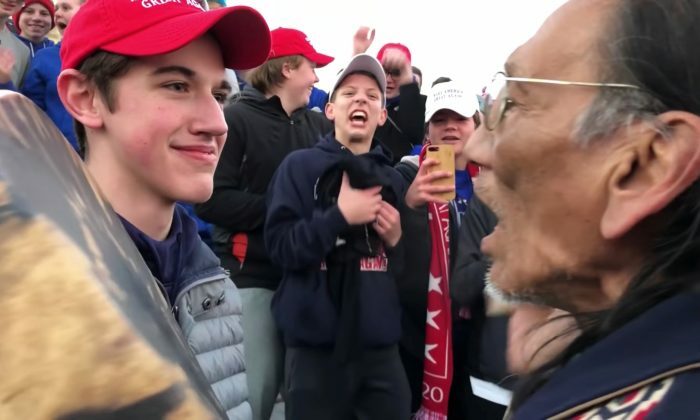 In the photo, the students are seen shouting at a black player from the opposing team, but, as posts from the discussion forum show, Covington fans had, and possibly still have, a tradition of taunting inbounding players, regardless of their race. Barnes explained it’s easier for private citizens to raise libel charges against a person who publishes false claims about them. Private citizens only need to prove negligence, such as failure to fact check, on the part of the publisher. Public figures, on the other hand, need to prove “actual malice” to claim libel, which means the publisher knew the statement was false or acted with reckless disregard of whether it was false or not. “In Kentucky, the law is even broader,” he said, mentioning that the mere “unflattering impression given and putting a person’s reputation in a false light” out of negligence is enough to sue for libel in the state. Barnes said last week that the students’ families, in accordance with their Christian values, wanted to give people who maligned them a 48-hour grace period to correct and take back their statements. “If they still refuse to do so, it’s clearly negligent for them to keep false statements up and they will be subject to a suit,” he said. In addition to the case built by Barnes, Sandmann’s family hired a large Kentucky public relations firm and an aggressive libel lawyer, L. Lin Wood, WCPO reported. “The intensity has been really striking,” he told The Epoch Times in a prior phone interview.